� Have you always wished you could draw your cat, your dog, the deer crossing the lawn, the robins at the birdbath, or the squirrel chewing peanuts at the feeder? Wouldn't it be great to have the confidence to sit down at a picnic table and sketch the chipmunks trying to snitch the taco chips right out of the bag? If you've always wanted to draw living, moving creatures and end up with a drawing you can be pleased with, a drawing that really LOOKS like what you were trying to draw, you need this workbook. 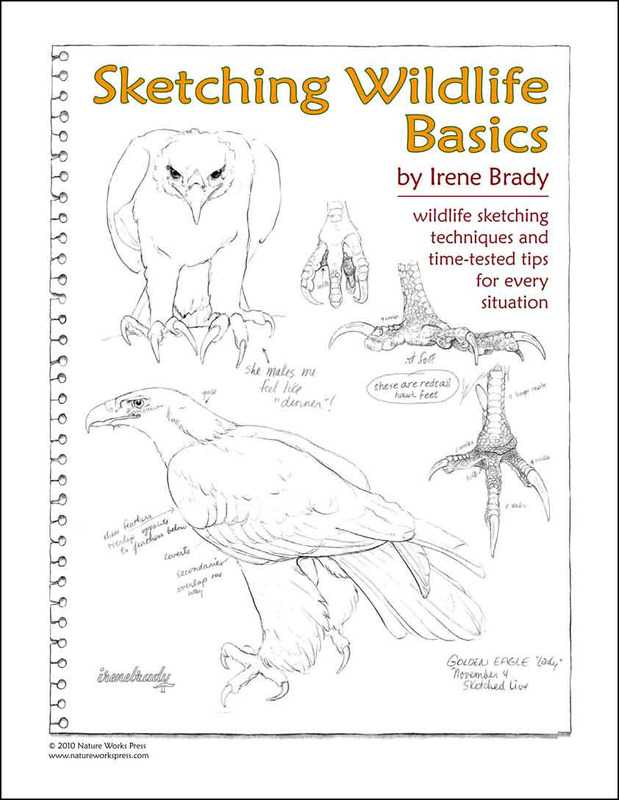 Created as the class workbook for an Irene Brady Wildlife Sketching Workshop, this book is filled with ways to jump-start your sketching prowess with sketching and drawing tips and specific tools to draw animals that move and change every moment. The only thing missing is the wildlife (if you don't have access to a pet or anything else lively, sketching from a video or TV nature programs). The techniques outlined here will work for sketching moving people, too. Starting with some warm-ups on how to really SEE what you are trying to draw in your sketchbook then how to get the initial starting points down on your paper, this workbook progresses, as the workshops did, through ways to deal with moving targets, getting the details, and what to draw first in case your subject moves or leaves the vicinity. 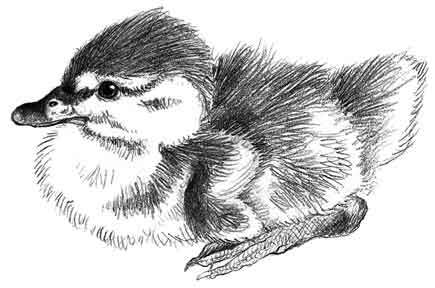 Additionally, this workbook is filled with assignments to get you comfortable with fur, feathers, and even ways to sketch on humid or rainy days when the paper doesn't take kindly to pencil and eraser. You'll learn how to shade things to show 3-dimensionality, how to make believable eyes, how to give a bobcat kitten and ducklings fur and down that looks soft enough to tickle your nose. What to do with that bird that hit the picture window? Find out here. What kind of notes, labels and descriptions will help you create fascinating sketchbook pages? Examples and discussion give you great ideas. A NOTE FROM IRENE: If you've ever considered ink or ballpoint pen as possible sketching tools, you may get the courage from this workbook to give them a try ~ I started sketching with a ballpoint pen in muggy Costa Rica when I discovered that my pencil would barely work on the moist paper, and was amazed at the results. 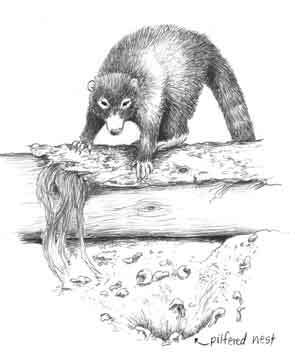 The coati pilfering a turtle nest at left was drawn with a ballpoint pen. Along with the joys of pencil and eraser, I share my enthusiasm about ballpoint sketching with you here (don't worry, you don't have to try it if you don't want to, but in some muggy areas of the world it might be the only answer). There's also a discussion of how to choose a sketchbook with the right kind of paper to meet your personal preferences. If you don't have any grounding in right-brain drawing, you should start out with the downloadable PDF Nature Sketching Basics to get up to speed. You'd also enjoy Nature Sketching Details which is second in the series, and deals with textures in nature (but not essential to get full enjoyment out of this wildlife workbook).